A pronoun, one of the eight parts of speech, is a word that replaces a noun or noun phrase. Since a noun is typically "a person, place, or thing," so too are many pronouns, but the latter are used in order to avoid repeating the noun over and over. And like nouns, pronouns can be subjects and objects, but they have additional uses that go beyond those of simple nouns. There are two main categories of pronouns – click the links for detailed lessons. Grammatically speaking, "personal" means that the pronouns have different forms for each grammatical person. 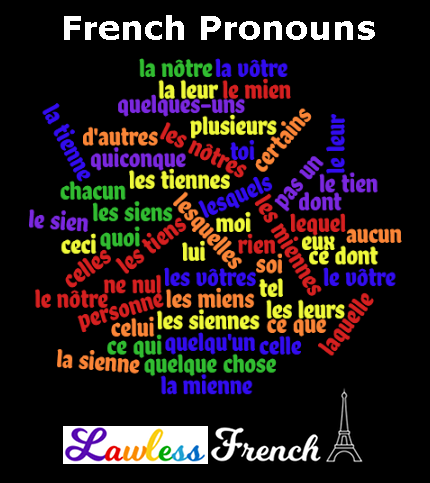 Subject pronouns, object pronouns, and stressed pronouns are among the various types of personal pronouns. Impersonal pronouns do not have different forms for each grammatical person. Demonstrative pronouns, possessive pronouns, and relative pronouns are a few of the different kinds of impersonal pronouns. Stuck? If you have a pronoun and don’t know what to do with it, check out The Pronommeur.